When was the last time you went shopping for clothes? What were you thinking about while you shopped? How much did you know about the companies you were purchasing from? If you are like the majority of consumers you were thinking about what you needed or wanted on that specific shopping trip. You were thinking about the cost of each piece of clothing you wanted. How well the individual pieces of clothing fit you, and you were probably feeling excited about the new additions to your wardrobe. My guess is that you were not thinking about the type of fabric the clothing was made out of. Or the impact growing and creating that fabric had on the environment. You probably were not thinking about where the garment was made. Who made it and if they were paid a fair wage. You probably didn’t think about how far it had to travel to get to the store you were purchasing it from either. I know. I have been there. These things never crossed my mind and I shopped all the time. It was one of my favorite things to do and eventually, it caught up to me. I decided to educate myself. I decided to learn about ethical fashion and how I can make a difference with my fashion choices. And now you can do the same. You have the opportunity to educate yourself and choose to become a conscious consumer. The fashion industry is the worlds second largest polluter, just after the oil industry! We consume roughly 80 billion pieces of clothing each year, up 400% over the last 20 years. 1 in 6 people works in the global fashion industry. Most of those workers are women who earn less than $3 a day. 250,000 Indian cotton farmers have committed suicide in the last 15 years. Partly as a result of going into debt to buy GMO cotton seeds from Monsanto. Only 10% of clothes donated to charity or thrift stores actually get sold! The other 90% end up in landfills or flooding the marketplaces in developing countries like Haiti, killing their local industries. These facts were taken from True Cost documentary, which I highly suggest watching to be further educated on this subject. So, what can we do? How can we, now that we are informed, help create change that will help both our planet and the people working in the unseen parts of this industry? We can create change by becoming conscious consumers. Every time we buy a piece of clothing we are casting a yes vote for the way that product was produced and the way that a company chooses to do business. We have way more power than we think. When enough people stop supporting clothing brands & companies that are taking advantage of people and destroying the environment they will have to make changes in order to survive. Businesses only stay in business when they have customers! Stop supporting and shopping with companies that do not use sustainable practices and are not transparent with their supply chain, and start shopping at and supporting companies that are transparent and are making an effort to adopt sustainable practices and policies. Check out the Fashion Revolution’s Transparency Index to learn more, where they rank the 40 largest global fashion companies. Shop for and buy higher quality clothing that will last much longer. This will cut back on your clothing consumption and the need for further shopping. It might cost more upfront but it will end up costing you much less over time because you will not need new clothes as frequently. Shop and buy second hand. 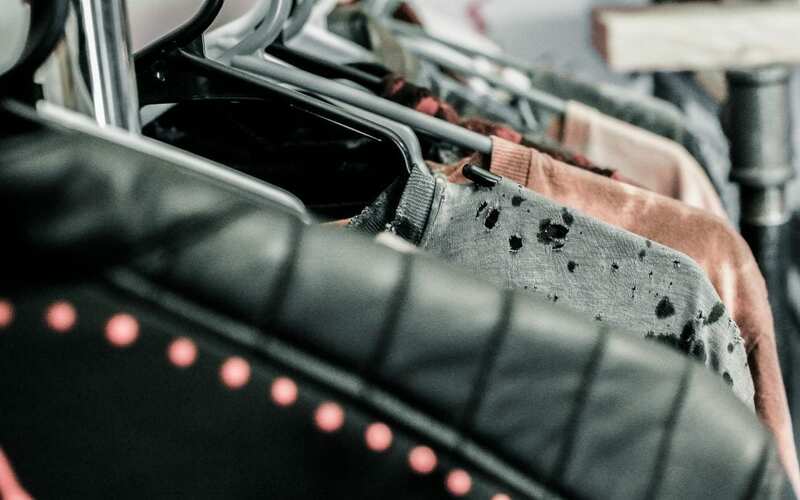 When we buy second hand we are not only saving money but we are keeping clothes out of the landfill and lessening the demand for new clothes to be made. Some awesome second-hand stores are: Crossroads Trading Co, Plato’s Closet, and Poshmark. Not yet a member of Poshmark use Code ALIBANKS to get $5 when you sign up! Fashion Revolution – This is a great organization that is leading the way in calling for a change in the fashion industry. It is a great place to learn about the issues and what you can do to help. Fair Trade Certified – This site is all about fair trade, helping you understand what fair trade is, why it is important, along with an extensive number of fair trade products and reviews.